Moira Nagorcka, the writer of this report, travelled on a three-week personalized tour organized by David Zweck of Zweck Tours. Some of the highlights of the tour were the visits to the villages of our Wendish and German ancestors and the Passion Play at Oberammergau, which is performed only every ten years. On arrival at Frankfurt airport in Germany on 25 August 2010, I met with fellow travellers from various locations, including Sydney, Brisbane, Adelaide and Melbourne. Others had already started their own travels and met with the tour group at our first stop at Rüdesheim, a famous wine town on the Rhine. After settling into the hotel we enjoyed a relaxing river cruise after our long journey. There were 26 people on the tour, travelling in three mini-vans, which enabled a daily mixing of passengers. On a walking tour around Rüdesheim, I immediately noted centuries of history, dating back to Roman times. A short distance away is the “Niederwalddenkmal”, a large elaborate monument built in 1873 to commemorate the foundation of the German Empire. Our next destination was the city of Ulm. On the way we visited the Sinsheim Auto & Technik Museum. Displays included a Concorde, cars of the Hitler regime, period costumes and early vehicles. 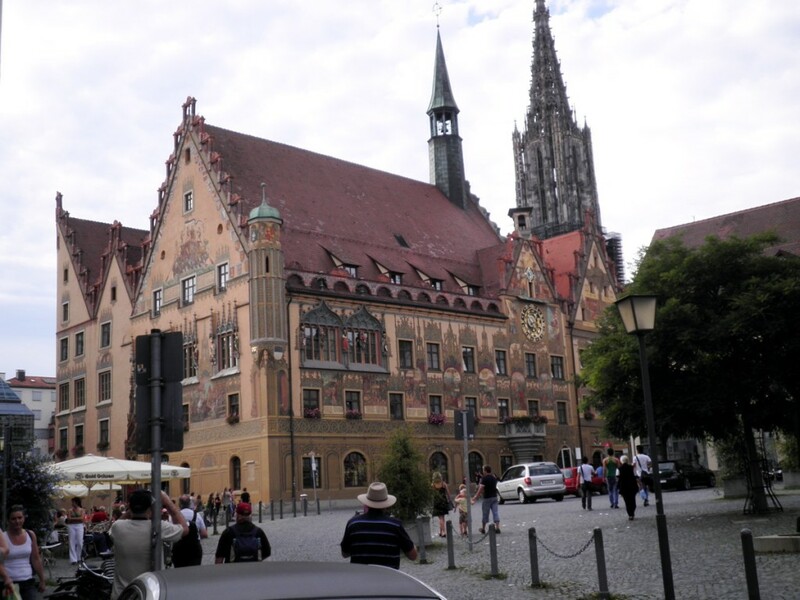 On arrival in Ulm we walked to the “Altstadt” (old city) to see a well preserved “Rat Haus” (Town Hall) with colourful scenes painted on its walls and an ornate gold leaf clock. The Cathedral, built in 1377, has one of the highest spires in Europe. 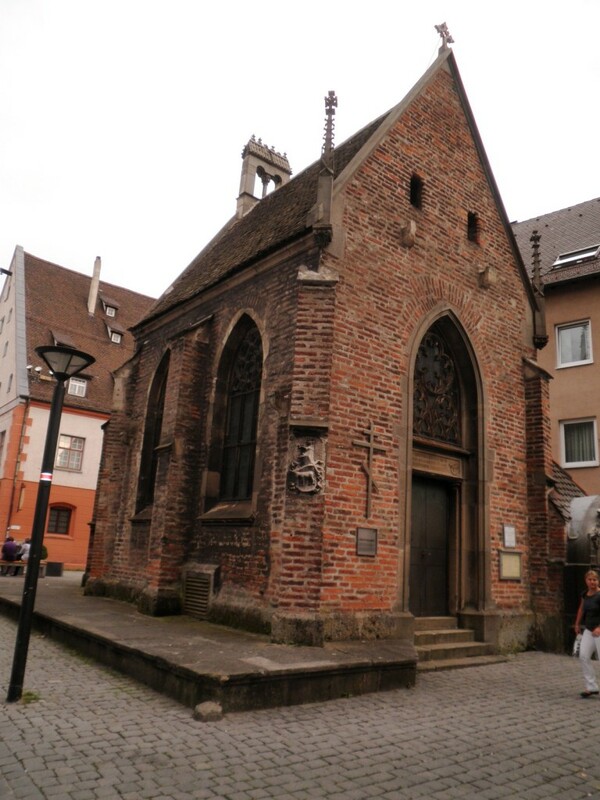 Nearby and almost unnoticed is Valentine’s Chapel, a small brick building built in 1475. Our journey from Ulm to see the Passion Play at Oberammergau in Bavaria was undertaken in steady rain which cleared just prior to the performance. The Play lasts for over five hours and commenced mid-afternoon, with a meal break half-way through, and finished in darkness. This was most effective during the telling of the Crucifixion and Resurrection. The Passion Play has been performed every 10 years since 1634. A highlight was the “Living Images” (actors in still-life scenes taken from the Old Testament), which preceded and complemented the story unfolding on stage. A total of 110 choir members and as many orchestra members combine with a large cast during the 102 performances held during the year. It is a massive undertaking much appreciated by the hundreds of audience members. Our accommodation was at nearby Ettal. We visited the church there and admired its ornate interior. Some of the tour group attended a service the next day at a Lutheran church, The Church of the Holy Cross, in Oberammergau. On the way to Innsbruck we visited the amazingly ornate palace, “Schloss Linderhof” (Linderhof Palace), of King Ludwig of Bavaria. Known as the “mad King” he sadly lived alone for the last 10 years of his life with 14 servants, surrounded by ornate baroque furniture, 22 carat gold plating and Meissen framed mirrors. Further on we visited “Wies Kirche” (Church in the Meadow), a large church almost isolated by surrounding farmland. Passing through the Alps, with postcard scenery all the way, we arrived at our hotel in Innsbruck. In Salzburg our first visit was to the Mirabell Gardens where scenes from “The Sound of Music” were filmed. We then visited the Mozart Museum which houses the original piano (built by Anton Walter in about 1780) used by Mozart. There were interesting arcades and shops to visit in the old part of the city. We visited Hitler’s “Eagle’s Nest” retreat at Berchtesgaden, Bavaria, 6,000 feet above the surrounding countryside. It was cold enough for a light dusting of snow. A highlight for me was attending a concert in the Marble Hall of the Mirabell Palace. Travelling through Bavaria we arrived at Röthenburg, a fascinating walled medieval town untouched by war. Cobbled streets and small specialty shops, including Christmas shops, abound. In the town square we met with the nightwatchman (appropriately garbed) and accompanied him on his rounds. Eisenach was just inside what was known as “The Iron Curtain”. A guided tour of Wartburg Castle revealed much. Built in the 11th century, it was constructed of 40,000 tonnes of sandstone, and is three storeys high. Walls are six feet thick in the cellar and four feet thick in the other rooms. The “sleeping room” for ladies has four million pieces of coloured stones and glass. The chapel was built in 1320. In 1521 Martin Luther lived at Wartburg Castle under the Protection of King Frederick the Wise of Saxony, and translated the New Testament from Greek to German in only 10 weeks. Luther created the current German language from 18 dialects. There is a Festival Hall and a Performance Hall, the ceiling of which Franz Liszt altered to improve the acoustics. Walking through narrow passages and stooping to pass through doorways, we passed a servant’s room and small study to locate the room where Luther worked. In addition to a small table and chair in the room I noted a footstool that was made from a single vertebra of a whale. J.S. Bach was born in 1685 and lived the first 10 years of his life in Eisenach. 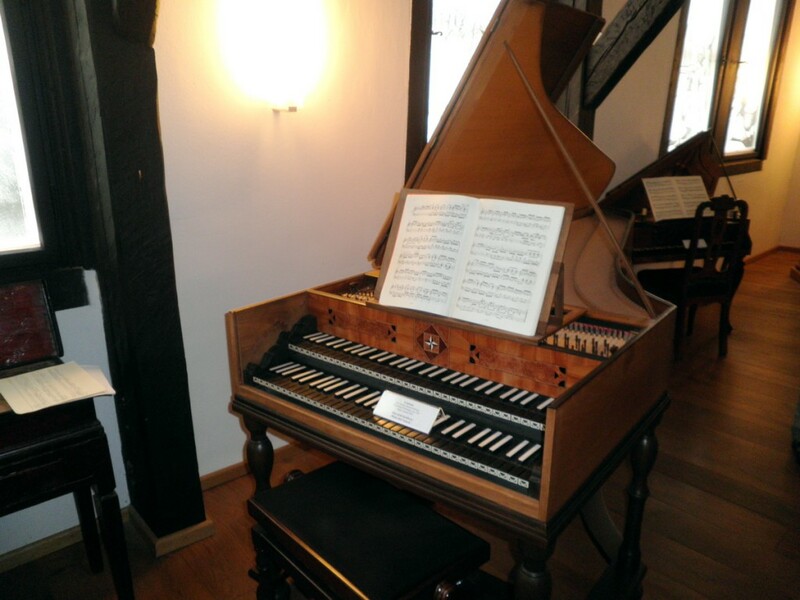 On visiting the extensive Bach Museum we were treated to a short demonstration of period instruments, including a chamber organ, a spinnet, a harpsichord with double keyboard, and a clavichord which Bach liked to play in the evening. Our journey from Eisenach to Leipzig included a visit to the remains of the Buchenwald Concentration Camp near the city of Weimar. Between 1937 and 1945 more than 250,000 people were imprisoned there. While observing the site of the camp I was compelled to pause and reflect. Fortunately we arrived at St Thomas Church in Leipzig in time for evensong by the famous Boys’ Choir. It was standing room only! Bach’s activity and creativity as choirmaster and organist at the church from 1723 – 1750 is well known. We also visited “St Nikolaikirche” (St Nicholas Church) which was a central point for peace prayer vigils which started the downfall of the East German regime. 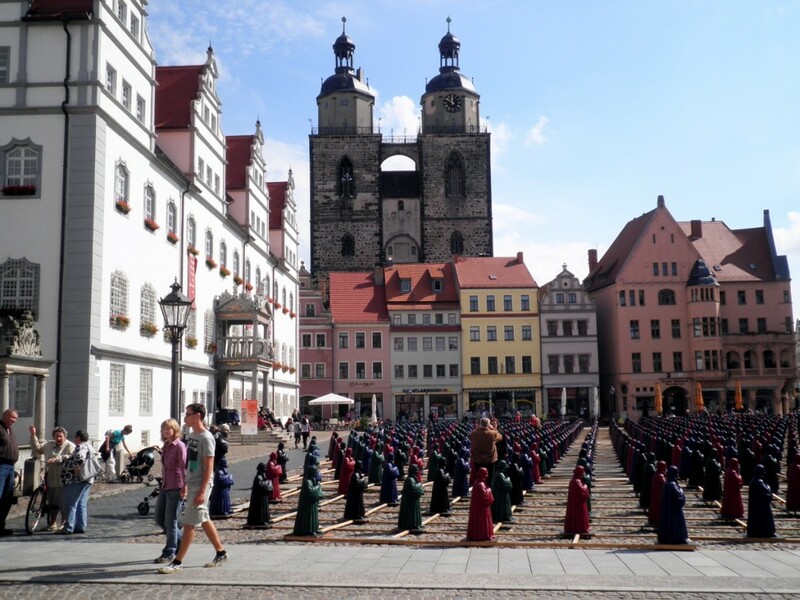 Leipzig is a vibrant city with fashionable shops, an Opera House and Concert Hall. We travelled from Leipzig to Colditz prison camp, a World War II prison for captured allied officers. There were many attempts to escape from the camp but few were successful. In Wittenberg we attended an English language service on Saturday evening at the “Stadtkirche” where Martin Luther preached, and which houses an impressive pipe organ. On the following morning there was a German language service at the Schlöss Kirche (Palace Church) where Luther’s grave is in front of the pulpit. It is easy to imagine Martin Luther walking the cobbled streets of Wittenberg, and a visit to the Luther Museum revealed much of his domestic and religious life. 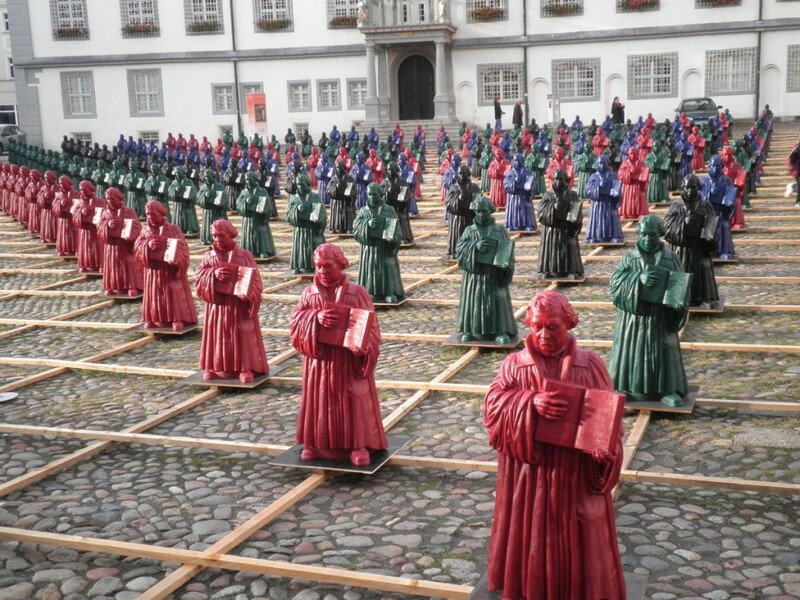 A renowned artist, Ottmar Hörl, created 800 figures of Martin Luther and these were on display in the market square in front of the Town Hall. The exhibit was part of the Luther Decade celebrations commemorating the period between Luther’s arrival in Wittenberg in 1508 and the beginning of the Reformation in 1517. We made a short stop at Torgau at the site where American troops met with Russian troops during the invasion of Germany in April 1945. We could see the castle of King Frederick the Wise. We visited the town church of St Mary’s. The construction of this late-Gothic church began in about 1390. Martin Luther’s wife, (born Katharina von Bora), died in Torgau in 1552 and is buried in this church. We visited six villages of our ancestors on the way to Bautzen, including Grosspostwitz, Rachlau and Hochkirch (the latter two being connected to my family history). Our accommodation in Bautzen was most welcome after a long day. Our tour party was met at the Polish border crossing in Görlitz by our local tour guide. Görlitz is split by a river into a Polish and German side. Silesia was the homeland of a large number of the tour group’s ancestors, and we visited five family villages on the way to the city of Zielona Gora (formerly known as Grünberg), which was our base for the next three nights. In Zielona Gora I visited a large, modern shopping centre which was in sharp contrast to the village atmosphere of a nearby market. The market featured a variety of stalls as well as performances by groups of young strings players. 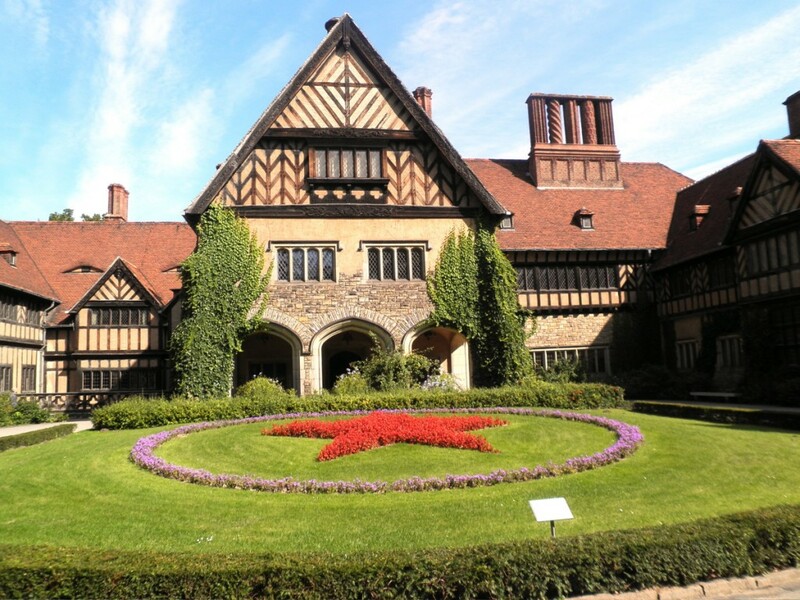 Our itinerary included visits to Tschicherzig, Klemzig, Langmeil, Züllichau and Bomst. After crossing the border from Poland, we continued visiting the villages of our ancestors, including Jänschwalde and Radeweise. In Radeweise I located the house of my great-grandfather, Christian Nagorcka, thanks to Anne Holzschuh, a local journalist and historian. There is a most comprehensive and interesting Wendish museum at Jänschwalde, depicting the way of life in that area. Travelling through the Spreewald we took a “kahn fahrt” (boat ride) at Lübbenau along some of the Dutch-made waterways. There are many kilometres of these man-made canals which are popular with locals and tourists alike. The small islands are ideal for relaxing holidays. After travelling through picturesque and peaceful countryside we arrived at our hotel in Berlin. We were surprised to see rabbits in a park in the centre of the city in the evening. On the following day we saw the Brandenburg Gate, the Jewish Memorial, “Checkpoint Charlie” Museum, and a large number of murals depicting the Fall of the Berlin Wall. A short service at the magnificent “Berliner Dom” (Berlin Cathedral) was inspiring, and the sound of the large pipe organ was most uplifting. Not far from Berlin we visited Potsdam and the palace of Sans Souci which was the summer residence of Frederick II, King of Prussia. A short distance away is the Cecelienhof Palace where the American, British and Soviet leaders held a conference at the end of World War II to determine the borders of Europe. Near Boizenburg on the river Elbe we saw “Checkpoint Harry” and old “Iron Curtain” artefacts which were once part of the border between East and West Germany. The border stretched for 1440kms from the Baltic Sea to southern Germany. Our itinerary included ancestral villages near Lauenberg which was a border post of the “Iron Curtain” until 1989. On the following day we visited the port of Hamburg from which ships departed to take our ancestors to Australia. Nearby is St Michael’s Cathedral, where some of our ancestors worshipped while awaiting departure. Finally, we said farewell to Hamburg, which brought our tour to a close, leaving us with many lasting memories.